Hatred by Willard Gaylin, M.D. 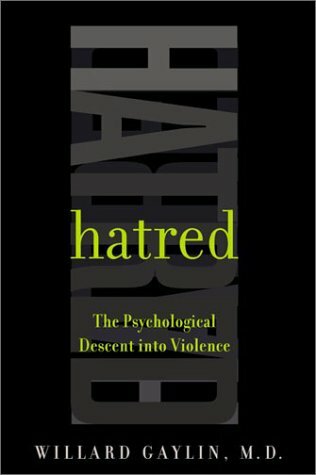 is a good introduction to understand the dynamics of hatred. Gaylin, a psychiatrist differentiates hatred from other emotions such as anger, rage, depression, frustration etc. He brings out that hatred is a disease of the mind. But he differentiates it from insanity and argues that a person who has committed a crime out of hatred should not be allowed to go free on the ground that he is no longer capable of controlling his actions. This argument lacks conviction and clarity to a lay person. Gaylin uses mainly two examples in his readable analysis of crimes of hatred, the holocaust of 1935 and the September 9/11 attack on WTC by Al Qaeda. He suggests that anti-Semitism is at the back of most hate crimes. He rightly suggests that fundamentalism is responsible for creating a horde of fanatics, who are ready to wage a battle against the enemy, those who don't subscribe to their ideology, and thus the infidel. While most of his analysis is quite lucid and informative, his argument that hatred must be dealt by normal, legal methods doesn't appeal. As rightly pointed out by him, both hatred and love are two sides of a coin and neither can be separated. So as long as love exists, hatred also is bound to exist. And as long as hero worship is possible, the battle against the devil, Satan also is possible. The same ordinary man on the street can be roused, can be hypnotized to go either way. The pendulum can swing in either direction. The book is useful to an ordinary educated lay reader as a way to better understand many of the problems of human psyche. But understanding a problem doesn't always result in its solution. The author has not really offered a workable solution to the problem of organized hatred.